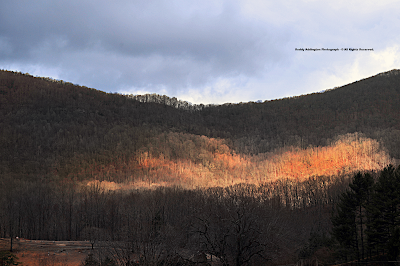 Lit by sunshine peeping through a subsidence induced crevice in orographic wave clouds forming above the High Knob Massif, the rugged opening of South Fork Gorge is illuminated adjacent to rolling Powell Valley farmland on February 25. This idyllic setting hides the fact that the first Severe Thunderstorm Watch & Warnings of 2011 were issued for the area overnight into the early morning hours. 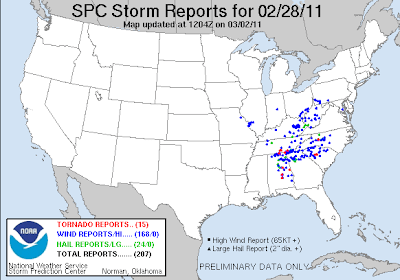 This was associated with the first major severe weather outbreak of the 2011 season, with 303 reports being preliminarily documented up to the western edge of the Appalachians ( Feb 23-25 ). 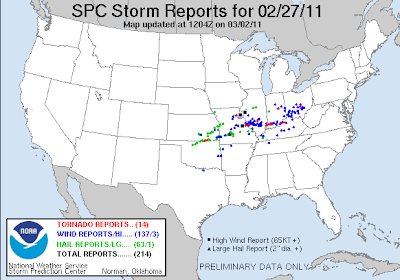 [ Outside of some locally severe wind gusts, with 45 to 55 mph gusts being most common, the main impact was heavy rainfall ( as documented later ) ]. 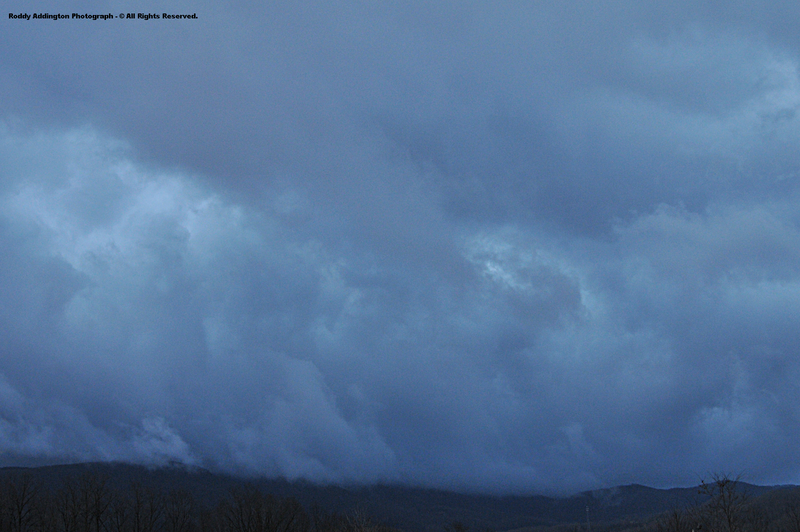 Only the bottom of ragged orographic clouds were visible obscuring the High Knob Massif at 10:06 AM, as winds fields were backing from SW to NW with cold air transport into the Cumberlands. [ With colder air rushing into the summit level of the High Knob highcountry than either below or above it, an inversion aloft was forming to cap low-level instability with a statically stable layer ideal for the formation and propagation of orographic gravity waves & horizontal convective rolls ( vortex streets ) ]. From 22,300 miles up a swell of clouds can be seen above the eye-like symbol representing the City of Norton, with fine structures of horizontal convective rolls also visible along long, distinct lines of clouds known as streets. Roddy was able to capture the structure of these amazing vortex rolls in the following two photographs ( via a small break in the capping cloud mass ). 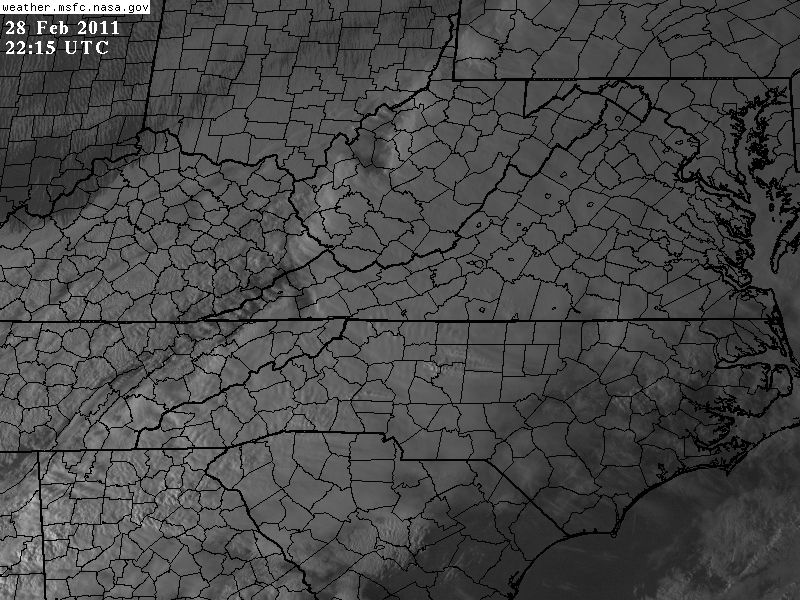 It is simply amazing to be able to put surface views together with NASA Visible Imagery. Roddy captured some incredible detail in the above photograph, which clearly shows the rolling structure of these awesome clouds! 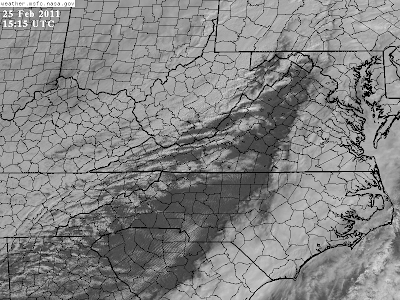 These would not be the only amazing clouds of this day, as will be shown during the afternoon ( on NW winds blowing across the High Knob Landform ). Sometimes we as people get PUFFED up and forget that we are merely a speck, tiny, minute in the big picture of what really surrounds us in the natural world! 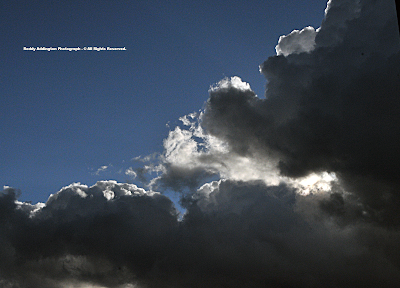 Like looking at the very bottom of the clouds above, we simply fail to understand how big and complex they truly are. 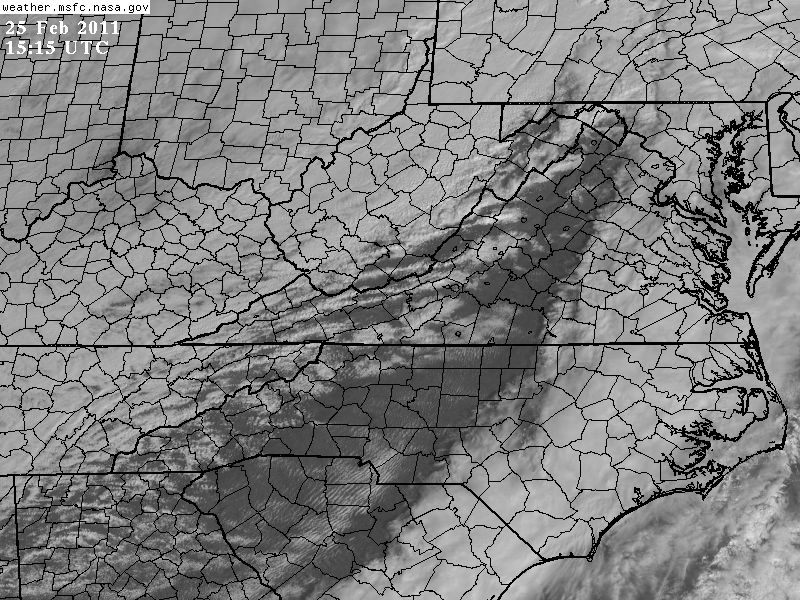 And so it is with the High Knob Landform. 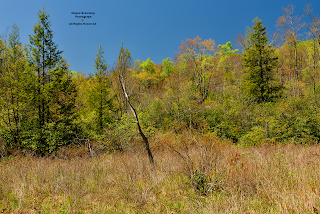 When you stand on the High Knob Landform you're standing upon a great structure whose roots extend downward for several miles beneath your feet, and whose surface spreads outward across ten counties and into three states. Perhaps it was by fate or twisted irony that one day it would be shown to all that this place merely called "The Knob" by so many would be revealed for what it truly is. of what "The Knob" truly is and represents! Looking at this beautiful, elevated farmland one would never suspect that a drenching rainfall of 1.75" to 3.00" had accumulated across the great High Knob Landform into the morning. Although the Doppler had some distortion, it did a good job of picking out the general pattern of rainfall enhancement as a mean southerly air flow was forced to rise upward into windward slopes of the High Knob Landform ( HKL ). 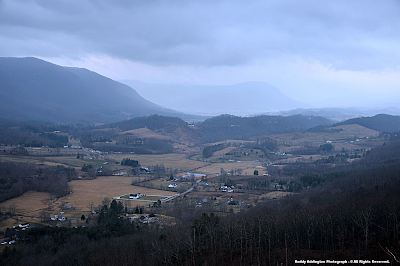 In the big picture, the largest rainfall variations were observed as air streamed north across the High Knob Landform, Tennessee Valley Divide, and Pine Mountain into eastern Kentucky foothill topography where amounts were diminished by downsloping to less than 1.50" ( locally less than 1.00" ). 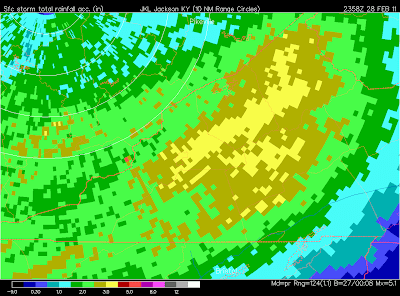 On the mesoscale, important variations in rain amounts occurred along either side of the High Knob Massif as it forced air to begin rising well upstream of its highcountry above Scott County while diminishing amounts markedly along its northern slopes ( with sinking air ) into Wise County. 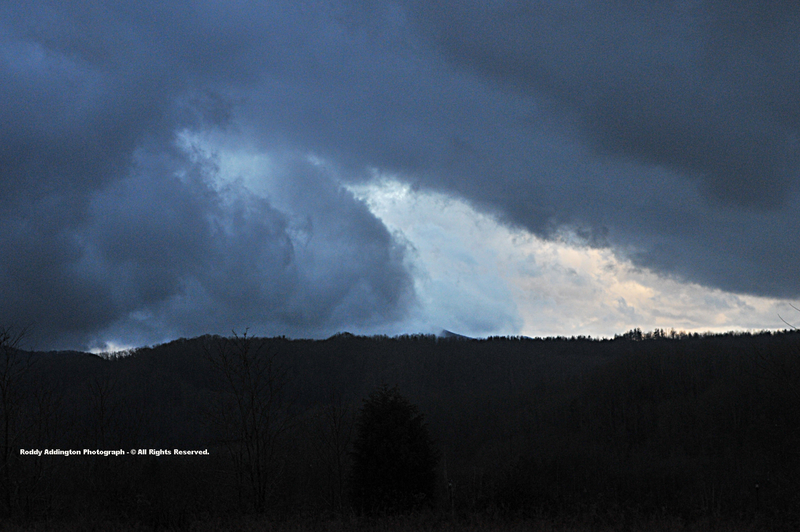 [ During the main period of SSE-S air flow rainfall amounts varied from 1.00" in the City of Norton to 1.44" at Fort Blackmore, near the Clinch River, and to 1.52" in Natural Tunnel State Park. An excellent example of how the massif forces more rain to fall upon the Scott County side in such settings ( * ). *The Fort Blackmore & Natural Tunnel State Park totals are from automated rain gages, such that true amounts were likely greater at both locations. The City of Norton total is hand-measured from an official 8"-diameter NWS rain gage at the Norton Water Plant ]. 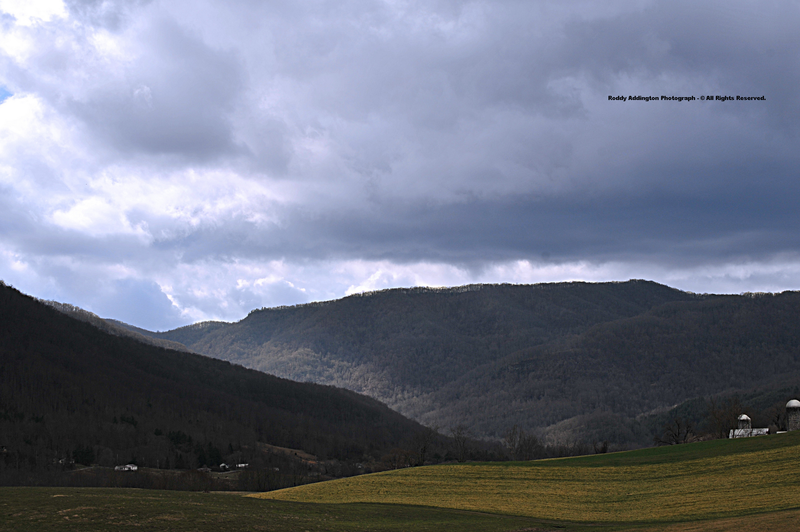 Southwest of the remnant highcountry massif, it is interesting to observe that these mesoscale rainfall variations disappear as heavy rain became widespread across Lee County with air streaming more easily across lower ridges of Powell Mountain and Wallen Ridge toward the northwestern flank of the High Knob Landform ( * ). 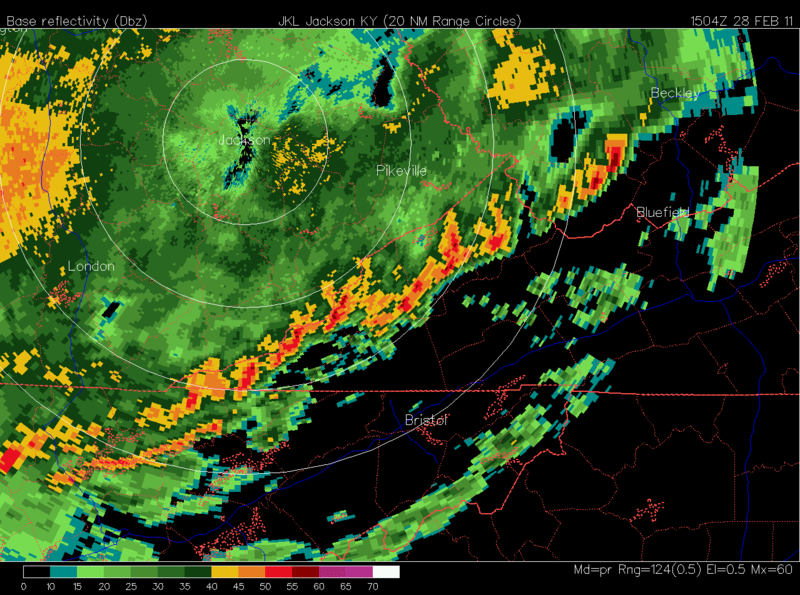 *Heavier rains again became focused along either side of Cumberland Gap National Historical Park and the higher topography of this section of the northwestern mountain flank of the HKL, with 3.01" officially measured in the Middlesboro Basin. 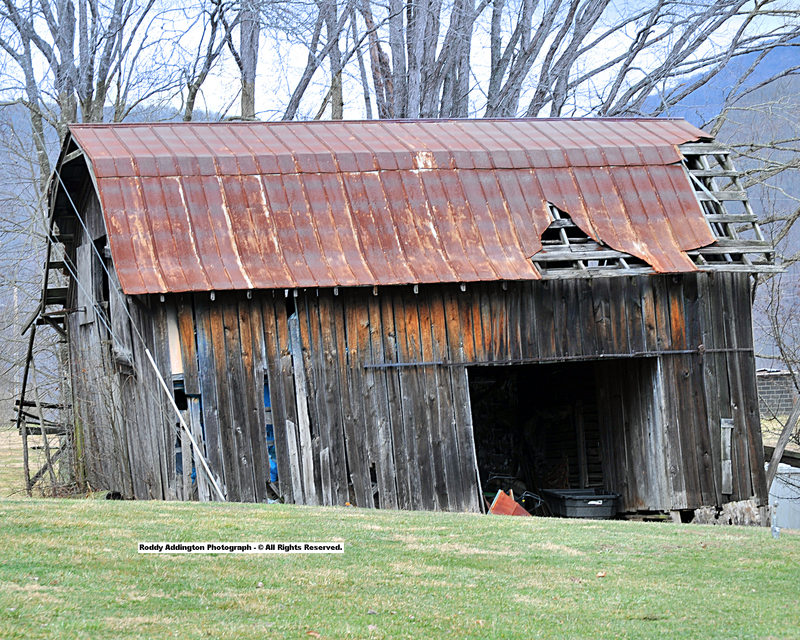 The journey this day for Roddy was part of a photography set on barns, but in the process he captured so much more along the way! 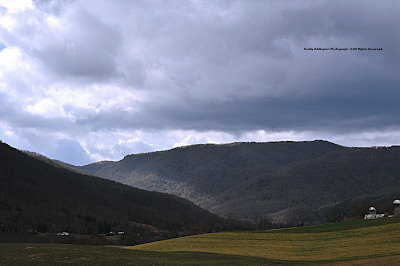 Vertically swelled clouds with a distinctly sharp base, as viewed from the Valley Floor, are actually seen to be part of an array of multiple cloud lines at the higher vantage point of majestic Powell Valley Overlook. From NASA imagery these look more dramatic as the rippling waves amplify further upon passing leeward of the massif and High Knob Landform into northern Tennessee. 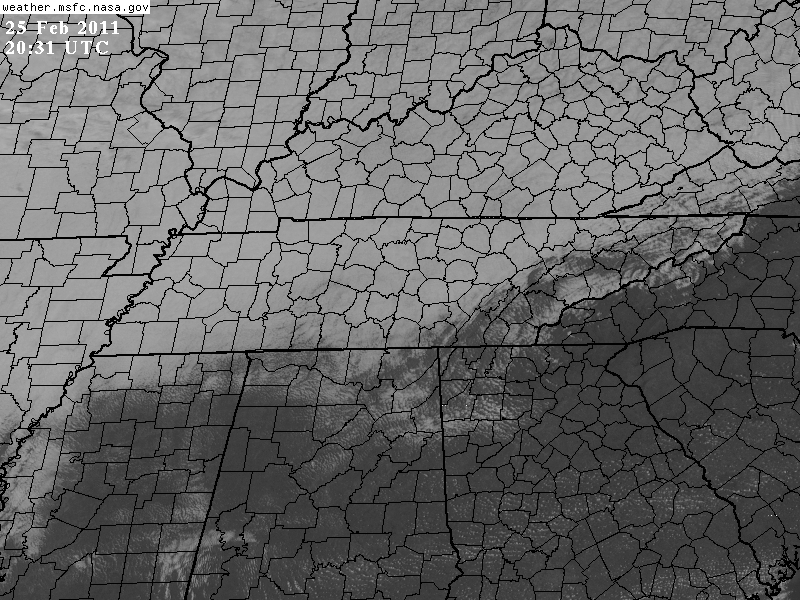 [ Note the very well defined waves across Scott County, Va., and Hawkins County, Tn., with an increase in spacing of the waves above Sullivan County as moisture becomes much more limited. 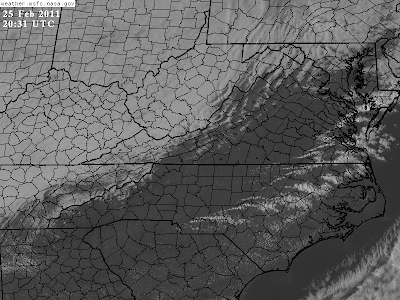 All the waves viewed by Roddy on the Wise County side of the massif being mostly undefined from space on the smaller scale, with only dominate wave crests visible ]. 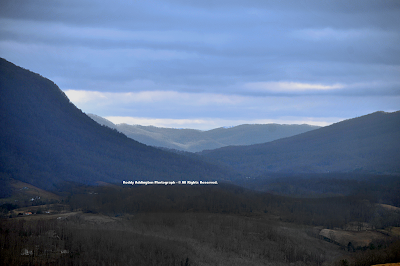 Moisture convergence and upsloping on the windward side of the High Knob Landform makes these orographic waves less visible than on the lee side, where inverse forcing enhances subsidence and extracts moisture to allow more sinking and sunlight penetration in between major wave crests. From a mathematical perspective, the precise relationship between static stability and buoyancy can be looked at in detail by deriving a second order linearly homogeneous differential equation whose solution yields a set of static stability criteria. The famous Brunt-Vaisala Frequency for buoyancy oscillations arises from this process, helping simplify the characteristic equation of the 2nd Order ODE to result in three possible solution cases, one of which defines the type of atmosphere necessary for gravity wave generation. [ The stable case solution essentially represents a sinusoidal variation about the initial equilibrium level of the air parcel, where the parcel oscillates about its equilibrium level with a frequency that is defined by Brunt-Vaisala ]. The bottom line, gravity waves can only exist in stably stratified portions of the atmosphere such that an air parcel displaced vertically will undergo buoyancy oscillations where the buoyancy force is the restoring force for the parcel. The climatic system, and life on Earth, would not exist as we know it without gravity waves, which are as vital to the presence of the fluid atmosphere as water waves are to the oceans. 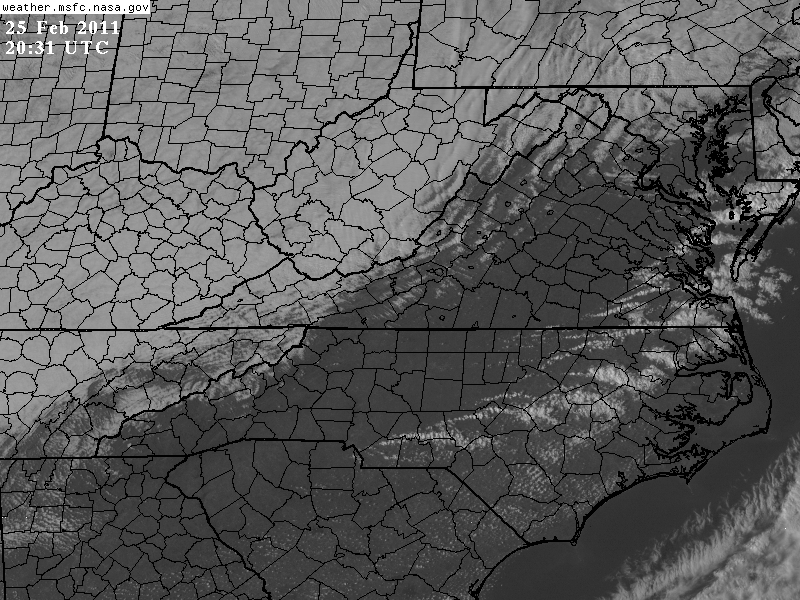 [ Gravity waves are generated by numerous sources, with mountains being one of the major sources. They act to transport mass, energy, and momentum from one place to another, and in this way enhance the importance of their points of origin to local, regional, and global weather conditions ]. 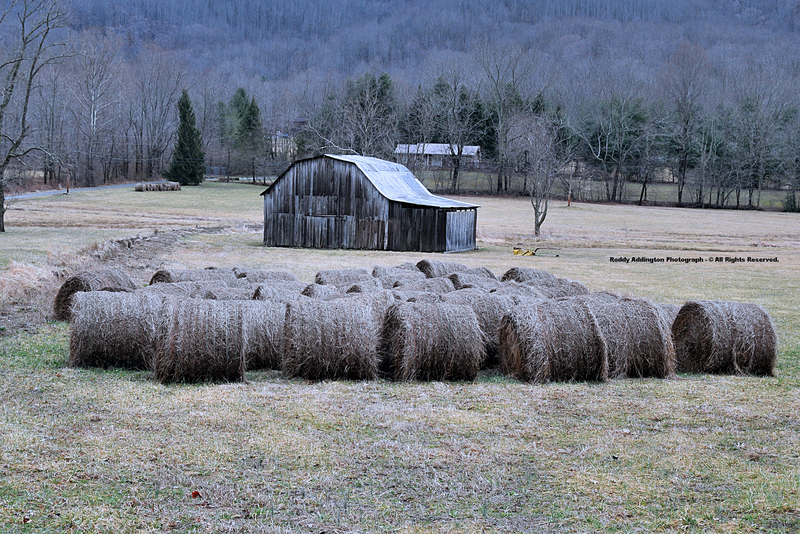 As Roddy was busy adding to his great set of barn photography in the Valley, Mother Nature was also at work cranking out more art of her own amid the heavens! 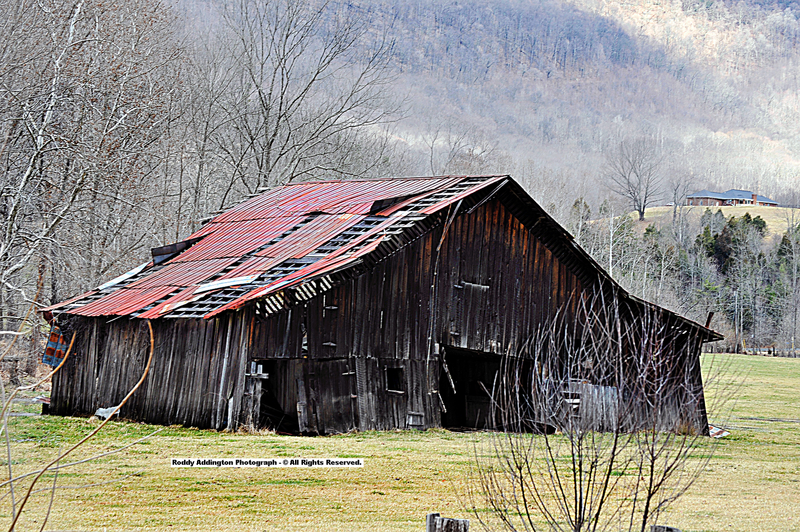 [ Old barns often have a colorful history, and part of that is associated with gusts of WIND in Powell Valley when SSE-SE air flows have the right conditions to generate mountain waves which may at times dip downward to the Valley Floor. While localized in nature, these gusts can be FEROCIOUS. 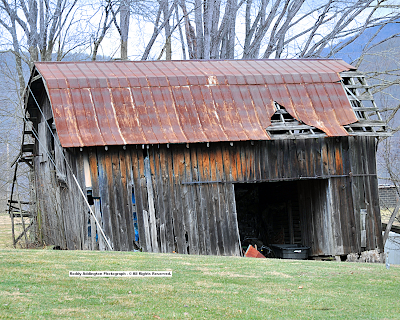 I happened to encounter one myself recently while driving along U.S. 23 in the Valley ]. 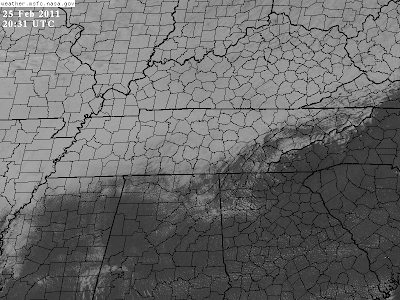 During this day winds were backing from SW to NW with time, and by mid-afternoon were aligned such as to generate awesome mountain waves as air rippled leeward of the northwestern flank of the HKL and its massif across Lee & Scott counties into northern Tennessee. Wow! 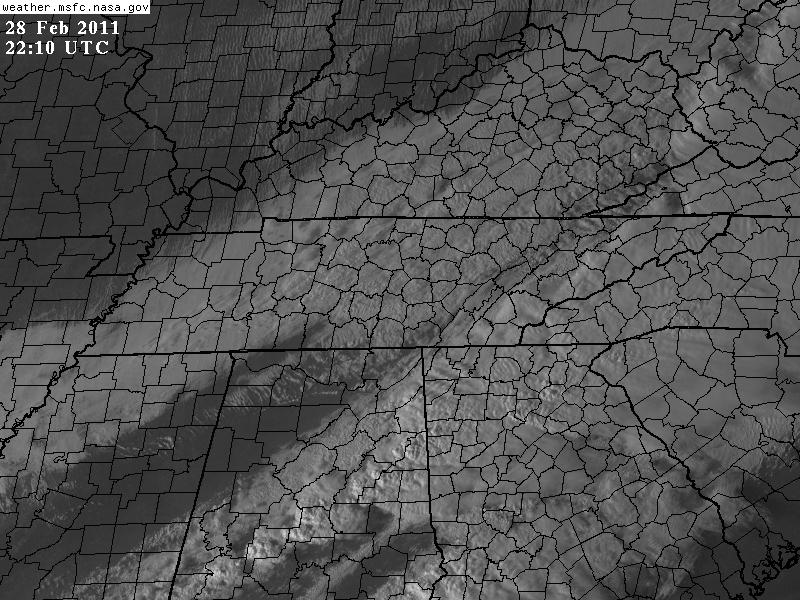 Looking from a different viewpoint it does not take a scientist to tell where the mountains begin, with that vortex-like roll cloud over Scott County looking simply spectacular from space! 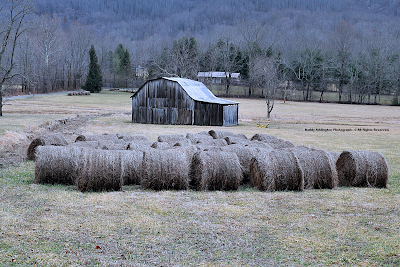 Strong cold advection accompanied the above setting as air temps plunged to 32 degrees in the City of Norton by 5:00 PM, with 20s across the High Knob Massif where icy clouds generated rime. 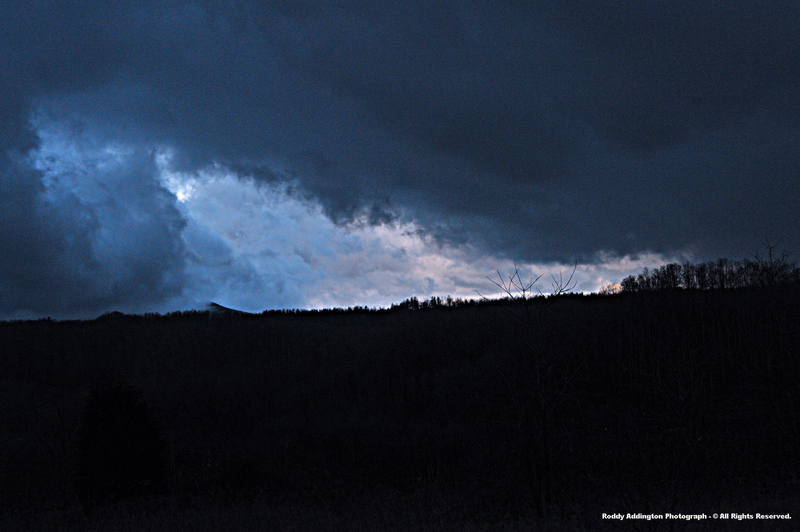 Ragged low-level clouds accompanied showers and some isolated rumbles of thunder as a rich SW flow streamed NE into the High Knob Landform during afternoon hours of February 27. [ Low hanging cloud bases are common when moist, SW winds blow upslope through the High Knob Landform into its remnant massif of highcountry. 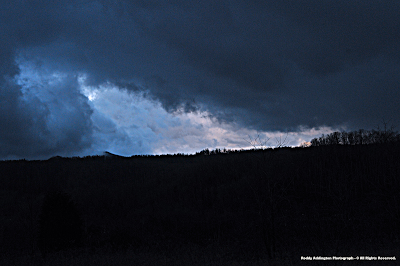 Powell Valley Overlook, along U.S. 23 in Wise County, Va., is a good place to view these often dramatic cloud formations that continuously change shape as they interact with the terrain ( this includes awesome gravity waves, a few of which will be highlighted later on NASA imagery ) ]. 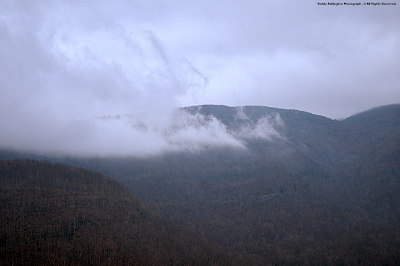 When cloud bases lower to cap and engulf the High Knob Massif in advance of a weather system, with other clouds forming far beneath the high crestlines, it signals that orographic enhancement of precipitation will be possible. [ The above is part of a seeder-feeder process associated with orogenic precipitation in which an enriched pooling of moisture in low-levels of the atmosphere ( feeder clouds ) is forced by terrain features ( * ). This acts to increase the amount and efficiency of precipitation reaching the surface from development zones located higher in the atmosphere ( within seeder clouds ). The actual magnitude of precip enhancement varies from one weather system to another due to a complex array of associated factors. *A visible cloud may not always be formed, as in some cases the feeder zone may only be an area of higher moisture content. Due to forced ascent, however, cooling and condensation into visible vapor is more likely the result in the HKL ]. 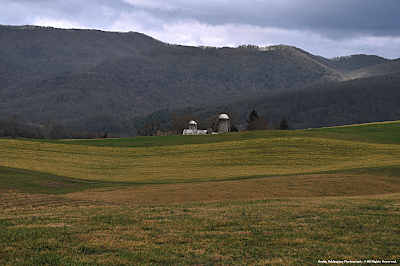 The Appalachians, and most mountains on Earth, do not generate their own precipitation, but rather act as enhancers of precipitation that is already forming or set to develop by larger-scale atmospheric features of the circulation. A rather interesting feature of the High Knob Landform is its ability to generate orographic gravity waves on SW air flows ( * ). 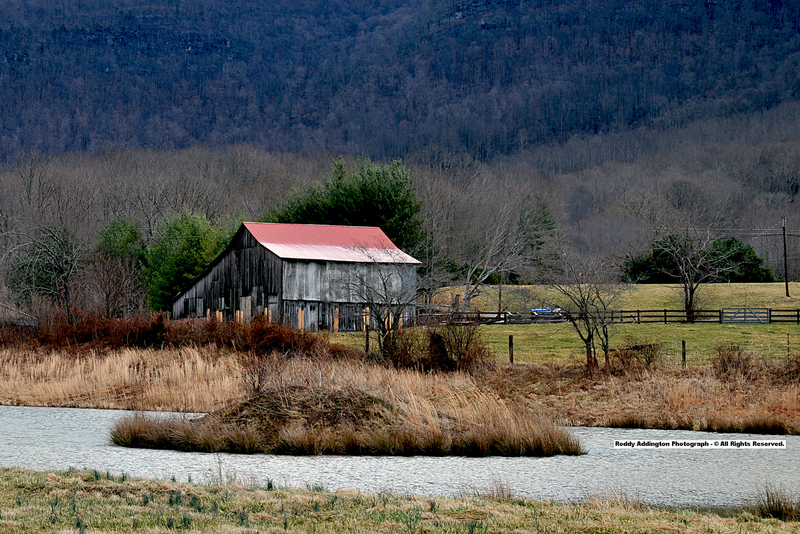 *Occurs within the High Knob Landform & Black Mountain sector of the Cumberland Overthrust Block and is part of SW flow forcing unique to both Virginia & Kentucky in its ability to change air temperatures, precip amounts and types, as well as generate gravity waves. Residents of the Norton-Wise area have long known that it tends to get very windy on SW flows, with both channelization & mountain wave formation at times acting to really crank up the speeds ( depending upon static stability parameters ). 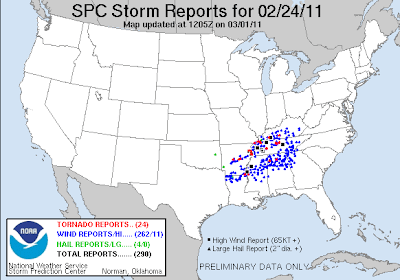 [ I use to be impressed by this while attending the University of Virginia's College in Wise, when I began to look deeper into what made winds so strong on SW trajectories ]. Lonesome Pine Airport ( LNP ) in Wise recorded a 59 mile per hour gust at 4:59 AM on February 28, as wind speeds suddenly increased to 43 mph sustained levels. While being flagged by some systems as a possible error, this was likely a true reading as such localized gusts tend to occur with mountain waves ( and are known to occur locally ). 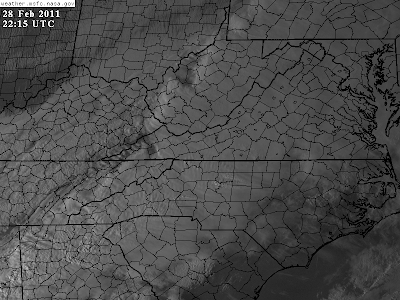 [ Note distinct wave clouds along the Virginia-Kentucky border, which were very well formed on SW air flow along the High Knob Landform-Black Mountain sector of the Cumberland Block. 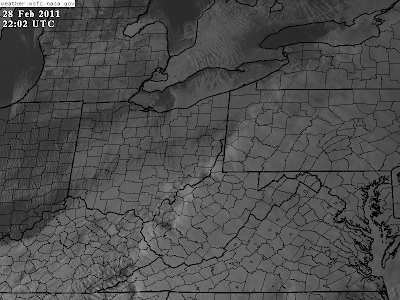 Although long lived, these clouds would soon dissipate via backing SW to NW air flow behind an approaching cold front ]. 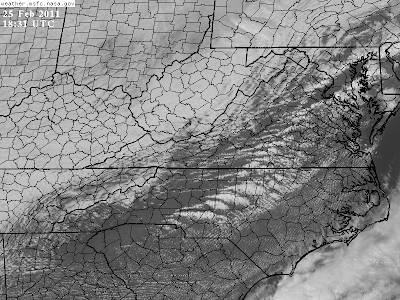 Although orographic gravity waves on SW air flow trajectories were present from February 27 into February 28, it was not until the higher level cloud shield associated with heavy rainfall began moving east that it became possible to view them on NASA visible imagery. [ The above being true except when all stable layers mixed out vertically, as with convection or a period of deep instability, since gravity waves can only exist over time in statically stable layers of the atmosphere ( as noted earlier ) regardless of wind strength ]. 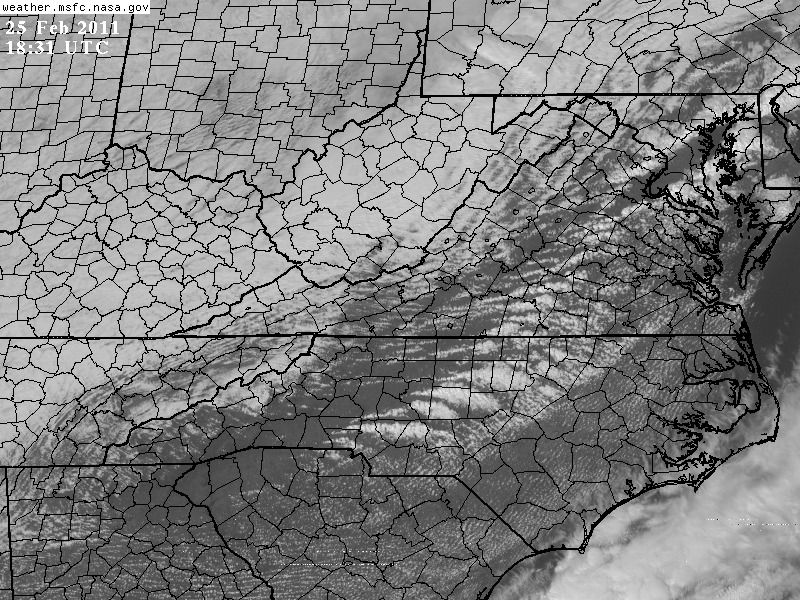 [ Many other wave form clouds are present on this satellite view, but by running a LOOP it was observed that nearly all were due to jet stream forcing at higher altitudes with propagation along the flow fields. 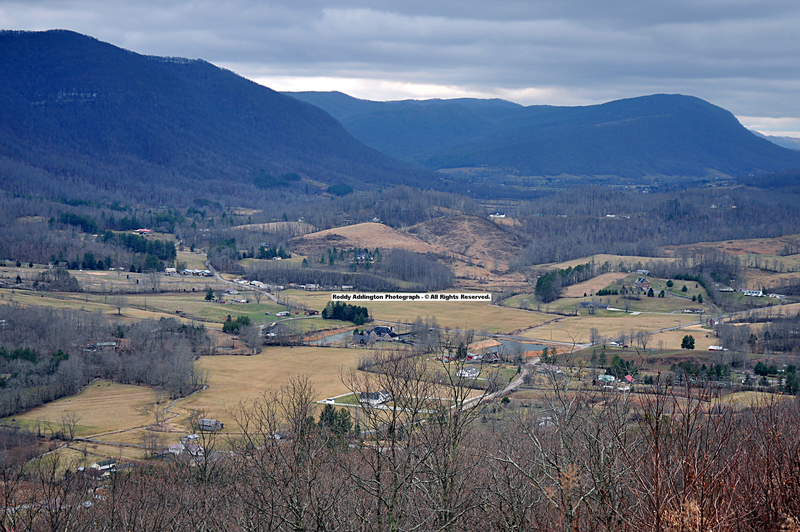 The wave clouds along the Virginia-Kentucky border, by contrast, remained in place over time to indicate orographic forcing by the topography ]. It may be observed how the last gravity wave in this distinct line is located above the Wise area, where it is a lee wave. 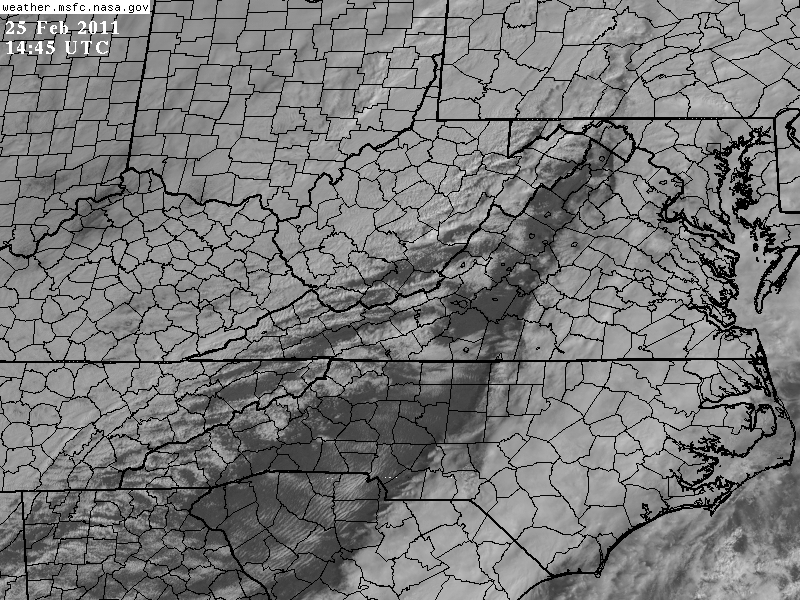 Such waves have been documented MANY times in the past above the Wise area, both by visual sight from High Knob and also by NASA imagery. [ While SW air flows are not generally associated with breaking mountain waves, like those of SSE-SE flows, any time such well developed gravity waves are present it opens up the possibility of them breaking or dipping toward the surface to locally accelerate wind speeds ]. 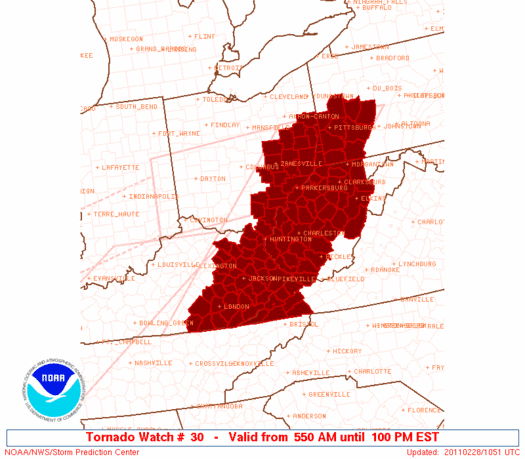 For the second time in only three days a tornado watch was again posted for the mountain region, as another major severe weather outbreak was well underway by February 28. Despite an extension of the watch for another hour, no tornadoes were locally reported. 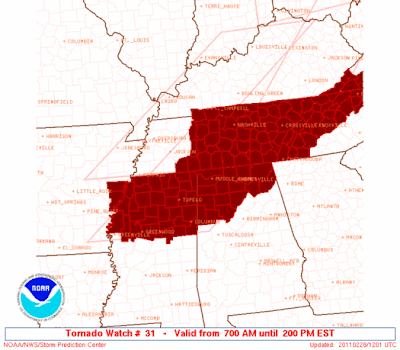 A major local concern was the squall line leading a large Mesoscale Convective System ( MCS ) into the mountains during mid-morning. 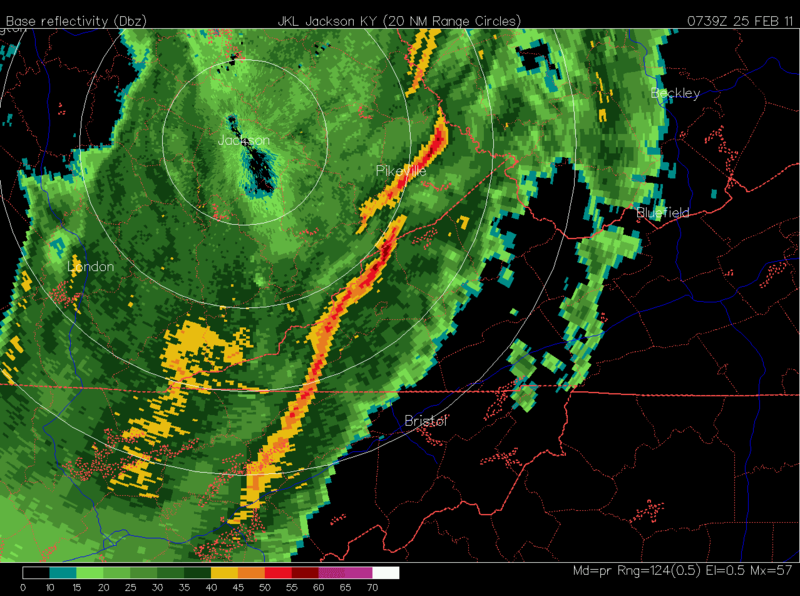 This was the second squall line to reach the mountains in three days, with more mini-bows & structures than the mostly linear line of Feb 25. The February 25 squall line came near the end of a significant rain event, while the February 28 line was just beginning another one that would also generate widespread 1.50" to 3.00" totals again! 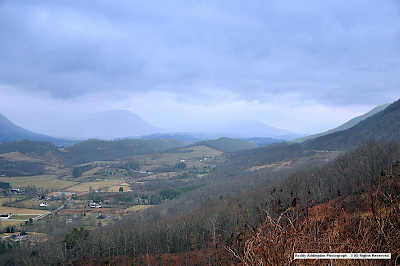 In reality, due to strong winds, it is unlikely that any place was able to measure a maximum of 6.00" during this period, with 4.00" to 5.00" of rainfall being more in line with rain gage catches across the High Knob Massif during February 24-28. 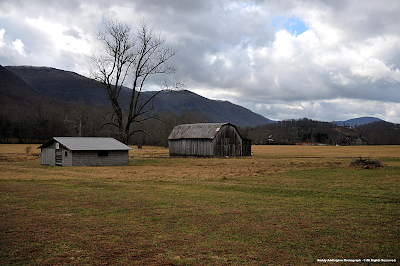 My friends Otis & Nancy Ward measured 4.46" of rainfall during February 24-28 within the lofty Robinson Knob community, with locally more in parts of the massif. Gushing whitewater draining the High Knob highcountry got steep creeks roaring, and helped to boost the main stem rivers of the Clinch & Powell to near Flood Stage. 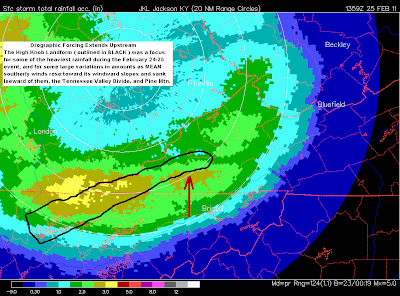 Impacts upon the Clinch River from this wet and stormy ending to February can be seen in two distinct crests, with the latest storm working upon wet ground in the wake of the February 24-25 event to push the river to flood stage ( an effective 15 vertical feet of total rise during this period ). 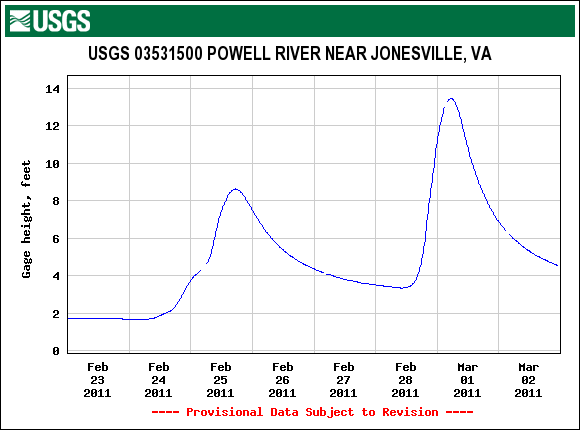 The Powell River crested a little lower but also had an impressive rise of around 12 vertical feet during this stormy interval. 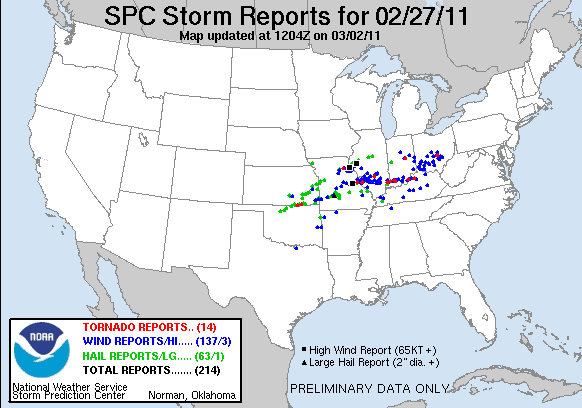 The Storm Prediction Center continues to update storm data with 421 severe weather reports being the preliminary count, as of March 2, for the February 27-28 outbreak. 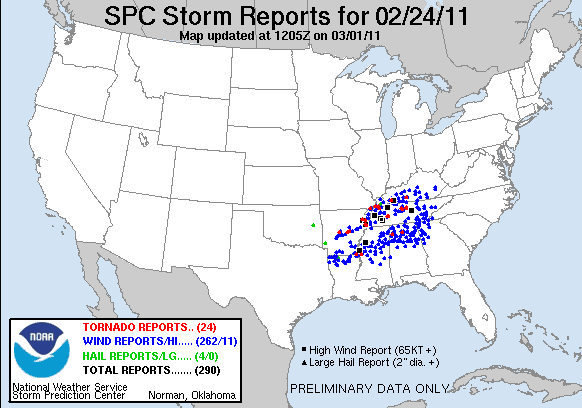 While no blue dots for wind damage are denoted locally, MANY tree limbs and small trees were broken and downed across this area. While many awesome photographs have been shown on this website in recent months, the above scene is the meteorological winter pick since it was the Christmas Holiday snowstorm which made December 2010 the snowiest on record in the High Knob highcountry ( and across the local area ). In the High Knob highcountry, average temps varied from 30 to 35 degrees in upper elevations by day to low-mid 10s at night amid the colder basins to generate mean temperatures of 20 to 25 degrees for the Dec-Feb period ( within colder locations above an elevation of 2400 to 2700 feet ). 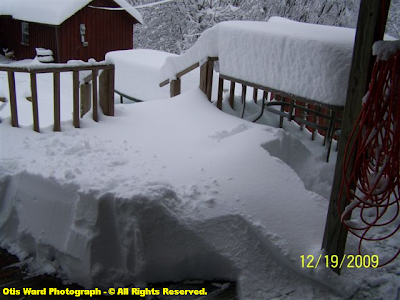 Precipitation was well below average despite an abundance of snowfall, with a general 90" to 120" of snow falling above 3000 feet in the High Knob Massif so far during the 2010-11 winter season. ( M ) - Indicates that the rain gage total is less than what actually fell due to evaporation-sublimation between hand-measurements and to physical gage loss in deep falls of snow. [ The rain gage was read 5 times during the Dec-Feb period, such that some evaporation-sublimation would have occurred between hand-measurements in addition to large amounts of physical gage loss during December, when more than 5 FEET of snow fell upon Big Cherry Basin ]. 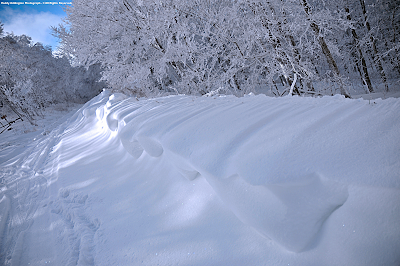 This was the second consecutive winter in which measuring precip in the High Knob highcountry was complicated by extreme winter conditions, with 100"+ of snow falling upon Big Cherry Basin during the December-February period. Gary Hampton, Superintendent of the Big Stone Gap Water Plant in South Fork Gorge, measured 4.70" of rain to close out February and open March at Big Cherry Dam ( 6.48" February 1-March 1 ). Appalachia Lake Water Plant: 10.67"
Big Stone Gap Water Plant: 11.84"
( M ) - Denotes physical gage loss in deep falls of winter snow. The rain gage was read on 15 days during the December-February period. Some evaporation & sublimation losses also occurred. *Precipitation is hand-measured daily at all the water plants in Big Stone Gap, the City of Norton, and Appalachia. The significance of orographic forcing within the High Knob Massif and its adjoining Landform area can be illustrated by looking at winter totals from across the Old Dominion. Staunton Water Treatment Plant: 4.54"
Kerrs Creek 6 WNW: 4.84"
Galax Water Treatment Plant: 6.30"
Meadows of Dan 5 SW: 8.14"
Trout Dale 3 SSE: 8.71"
Note: Missing days may or may not have had any precipitation at those sites denoted to have missing days, with every day being measured unless otherwise noted. To illustrate that precipitation departures observed during this winter between the High Knob Massif area and other locations in Virginia are common in the mean, lets review totals from several recent seasons dating back to the last La Nina winter. 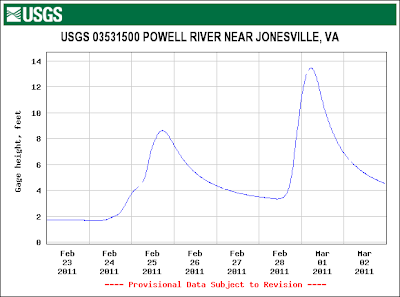 Trout Dale 3 SSE: 8.68"
Meadows of Dan 5 SW: 8.74"
North Fork of Pound Dam: 9.20"
Head of Powell Valley: 11.72"
Appalachia Lake Water Plant: 11.83"
Big Stone Gap Water Plant: 13.75"
( M ) - Denotes evaporation-sublimation losses from the rain gage between hand-measurements during the period. 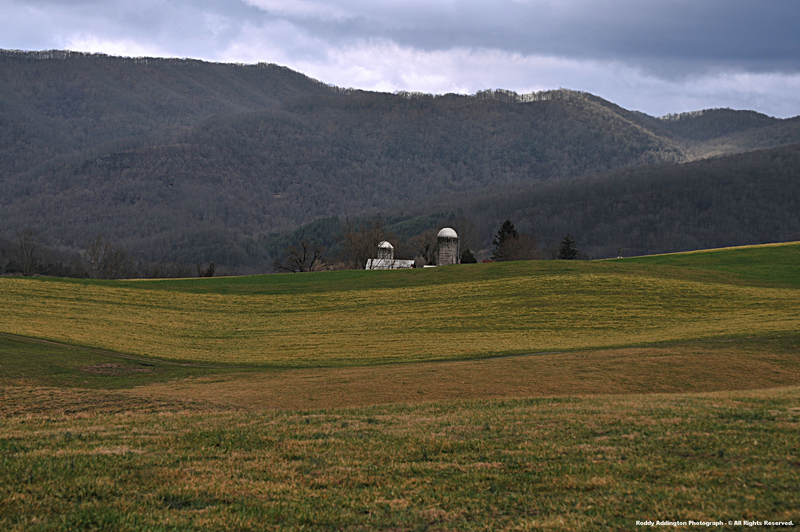 The La Nina winter period of 2007-08 generated a similar pattern of precipitation across Virginia, well below average in all locations, with much less snow and more rain in the High Knob Landform. 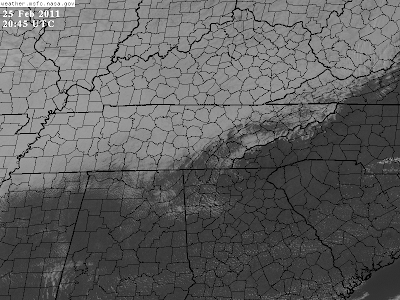 [ Only 70" to 80" of snow were recorded at highest elevations in the High Knob Massif ]. Trout Dale 3 SSE: 7.13"
Meadows of Dan 5 SW: 11.59"
North Fork of Pound Dam: 12.85"
Head of Powell Valley: 17.66"
Appalachia Lake Water Plant: 18.23"
Big Stone Gap Water Plant: 19.77"
( M ) - Denotes evaporation-sublimation losses from the rain gage between hand-measurements during the period, as well as some physical gage loss in deep snowfall during February 2009. 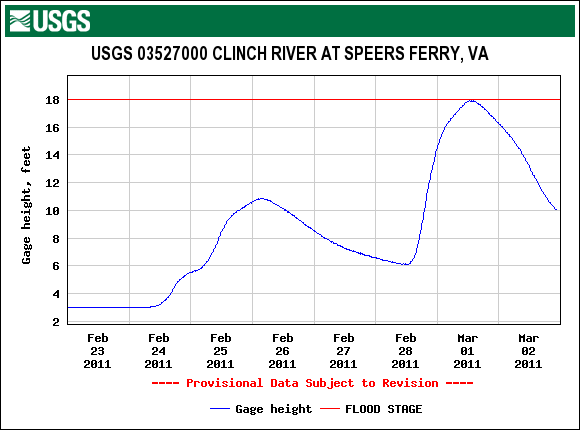 Significant rains and snows were part of the active meteorological winter period of 2008-09, with both December & January having more than 9.00" of total liquid equivalent precip in parts of the High Knob Massif ( 17.72" at Big Cherry Dam ). 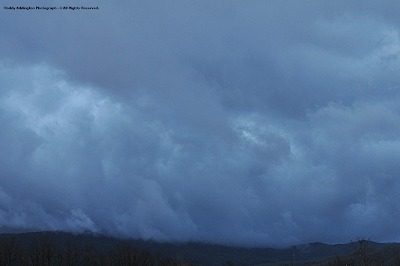 This was an impressive orographic forcing winter within the High Knob Massif, with the 9.23" of precipitation measured by Gary Hampton at lofty Big Cherry Dam in January 2009 alone being more than most of Virginia measured during the entire Dec-Feb period of meteorological winter ( east of the Clinch River Valley and portions of the southern Blue Ridge ). [ A general 80" to 110" of snowfall accumulated above 3000 feet in the High Knob Massif during the 2008-09 season ]. North Fork of Pound Dam: 10.57"
Meadows of Dan 5 SW: 16.33"
Big Stone Gap Water Plant: 17.62"
Trout Dale 3 SSE: 19.31"
*Due to severe winter conditions in the High Knob highcountry the monthly totals had to be estimated at Big Cherry Dam, with 150" to 200" of total snowfall across the main crest zone of the massif. A MEGA-snow dump during December 2009 blocked entry into the Dam area for weeks. ( M ) - Denotes rain gage totals are less than what fell due to large amounts of physical gage loss in deep snows and evaporation-sublimation between hand-measurements ( this also applies to conservatively low estimates made for Big Cherry Dam ). 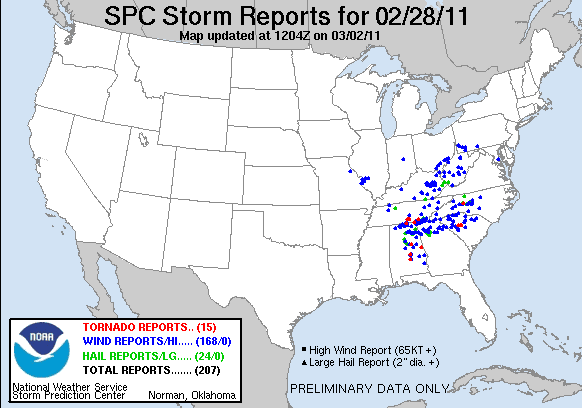 The El Nino winter season of 2009-10 was a different kind of animal across the Old Dominion, with widespread significant precip events from border to border during the meteorological winter period. This included excessive snows amid the High Knob Massif, with 40" or more falling during each month of the December-February period upon upper reaches of Big Cherry Basin. Mean: 18.28" or 6.09" per month. 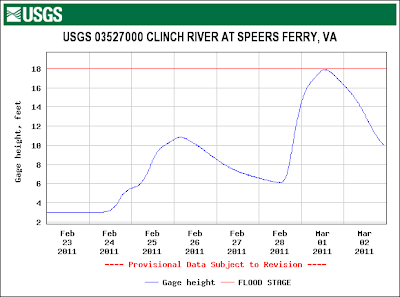 The significance of this, of course, being that despite missing data during each winter it is still the greatest that can be found in Virginia ( can be extended back further in time & remain true! ) ]. 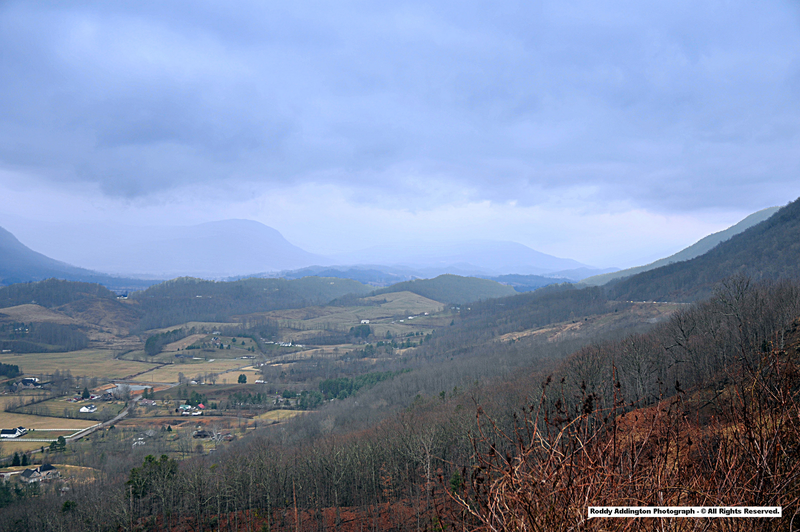 Although any given location might have excessive precipitation during a given month or season, the consistency of significant precipitation observed amid the High Knob Massif during the orographic forcing season is proving to be unmatched in Virginia. [ The orographic forcing season generally runs from November through April, but sometimes may include October and/or May, and is defined as being that time of year in which synoptic-scale storm systems develop pressure gradients that push against the topography ]. This first caught my attention, of course, with snowfall at the start of my climatic study in the 1980's, with great forcing seasons following then showing me the true significance of the HKL! [ The December 1993 to March 1994 period being an excellent example, with 34.00" to 40.00"+ of total precipitation from the City of Norton across the High Knob highcountry ( 43.63" being hand-measured at the Norton Water Plant from November 1993-April 1994 despite missing moisture during the winter in deep snowfall when they were still using a 4"-diameter rain gage ) ]. 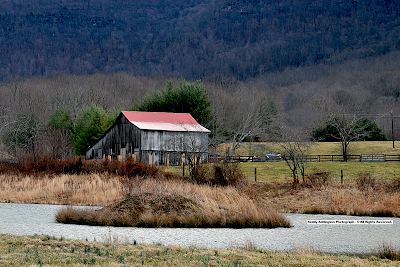 In the big picture this wettest part of Virginia is the missing link, never before recognized, to the great biodiversity & karstification of the High Knob Landform and its Upper Tennessee River Basin ( via distinct formation of diverse climatic gradients ).